In my last post, I talked about how to use email to get even more out of your most valuable users (your customers!). Email is certainly a tried-and-true digital channel, but it’s also limited, especially in the case of app retention and engagement. In the go-go-go mobile world of 2018, adding any extra steps (e.g., checking email) to a conversion funnel is a deal-breaker. If you have an app, and you’re trying to goose users into action, push notifications are the way to go — yet they’re used less than optimally by many marketers. In this column, we’ll break down the not-yet-mighty push notification: general best practices, opt-in best practices, two main ways to segment your customers, timing best practices and push notification types. Provide value. What does your customer get out of interacting with your push notifications? Is it an exclusive sale? A fun bit of trivia? Whatever it is, make sure it’s clear and gives the user insider access to something that non-users won’t get. Make it visual. Adding pictures and videos to a push notification can result in more powerful storytelling by triggering emotional responses in users that plain text simply can’t. A study from Urban Airship revealed that including imagery in push notifications can increase direct open rates by up to 56 percent. If you’re selling a product that’s on sale, add a picture of the product. If a deal is expiring, add a clock. It doesn’t have to be elaborate. Personalize. A mobile phone is a personal device. If you’re communicating directly on the phone’s interface, include the user’s name (or at least past behavior) to mimic the feel of a one-on-one conversation. Personalized push notifications have an open rate four times higher than their generic counterparts, according to a Leanplum study. Before users take any action on your push notifications, they must opt in. However, this often presents a challenge. According to Accengage, only 43 percent of iOS users opt in (Android users are opted in automatically when they install an app). In working with our app clients, we’ve confirmed five truisms that will help improve your opt-in rate. Convey the value of your push notifications. Include value propositions that specifically focus on the benefits users will receive from push notifications. Ensure these value propositions are displayed under the app store description, as well as when users first engage with the app. If users understand the value and purpose of the notifications, they will be far more likely to grant permission. Use a “soft-ask” approach. You can only send the official permission prompt to users once, so it’s important to use a soft-ask approach. First, use in-app messaging to ask users if they want to receive push notifications. If the user says “yes,” then present them with the official permission prompt. If the user replies “no,” allow them more time to find value in the app before asking again. Consider making an in–app micro-permission control center. In-app micro-permission control centers allow users to select the types of notifications they are interested in receiving. Let’s say you’re selling coffee. Create a control center that allows users to dictate the roasts they enjoy and would like to receive notifications about. Leverage in–app messaging on customers who refused to grant permission. While you can only send the official permission prompt to a user once, you can leverage in-app messaging as many times as you want. Customers who answered “no” to the official permission prompt should be targeted with in-app messaging that highlights the benefits of receiving pushes from the app. These messages should also include a link to “Settings” from which push notifications can be enabled. 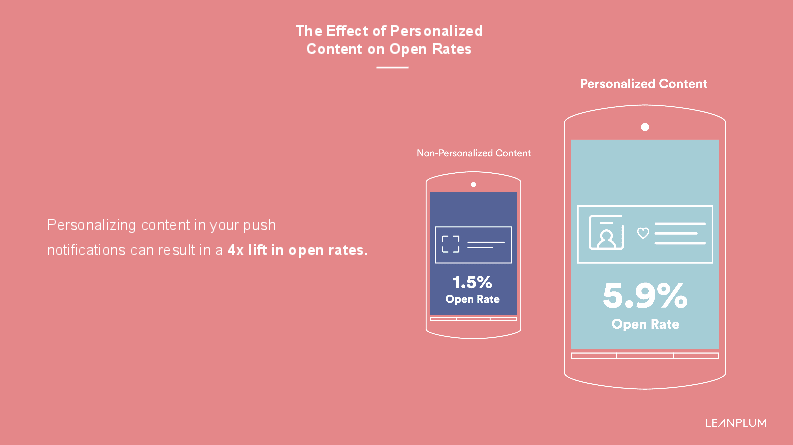 The more tailored to its audience a push notification is, the higher its open rate will be. As such, segmenting is imperative. One effective way to segment your user base is through their behavior. Looking at the various ways customers interact with the app provides valuable insight into what they care about and how engaged they are with the brand. This, in turn, helps us understand how often we want to send them pushes and what aspects of the app to highlight when we do. Potential customer segments that can be used to understand how engaged certain customers are with the app include disengaged, somewhat engaged and highly engaged. Let’s say you have a user who downloaded your app a couple of weeks ago, browsed once and hasn’t returned. Don’t flood that user with notifications; they’ll be more likely to see them as spam. On the other hand, if you have a user who browses often and has yet to pull the trigger — especially if there’s a relevant holiday coming — you can increase frequency to remind him/her that there’s an item waiting for them to purchase (e.g., an Amazon user who adds a grill to his/her cart in June might be more open to purchasing as July 4 approaches). Another effective way to segment users is by their preferences, which informs strategy on which products customers care about the most. We can gain insight into users’ preferences by looking at their past engagement with products through the app and website and by defining their inclusive and exclusive traits. Inclusive traits. When a user interacts with a product through the website or app, this indicates they have a positive preference towards that item. Exclusive traits. When a user ignores promotions or emails for a certain product, this indicates they might have a negative preference toward that item. If a user has clearly defined traits, make sure to use push notifications aligned with their inclusive traits, and scale way back on notifications aligned with their exclusive traits. The effectiveness of any push-notification strategy is largely dependent on timing. The day of the week, time of day and frequency at which you send push notifications can drastically affect their open rates. Consider your users’ time zones. The last thing a push notification should do is wake a customer up in the middle of the night. Take time zones into account to ensure that all customers are receiving pushes at reasonable times. Avoid scheduled blasts. A study from Leanplum showed that pushes sent out during times when users are prone to engage with their app have open rates almost 3x higher than that of pushes scheduled solely by time zone. Think about what times and days during the week your users typically engage (e.g., Sunday afternoons are a great time to push the Safeway app), and consider how this may vary by region, demographics and user behavior. Progressively increase the intervals between pushes for disengaged customers. Customers who are disengaged with the app must be dealt with very carefully, as sending too many pushes to someone who isn’t invested in the brand could easily cause them to delete the app. Instead of spamming potential defectors, use a push strategy in which you progressively add more time between each push. For example, the first push might come after a week of inactivity, the second will come after two weeks, and the third and final push would be sent after a full month of inactivity. Never stop testing. While these guidelines may provide a nice starting point for a push strategy, it’s imperative to keep testing and honing your timing and cadence to find the optimal times to reach your users. There are many different types of push notifications that can be used to accomplish a variety of goals, ranging from informing users of new promotions to providing them with industry-related entertainment. 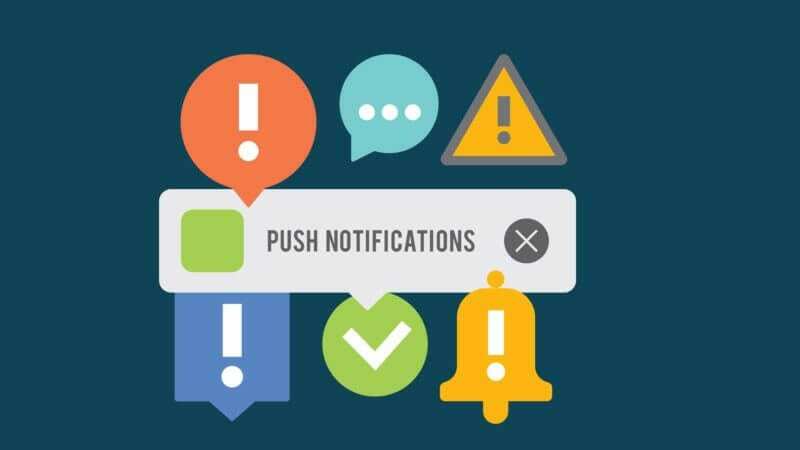 Below are examples of common types of push notifications. Pizza Hub offers a discount in its welcome push, which effectively conveys to the customer the value of receiving push notifications. Gilt updates users when items they are interested in come back in stock. Use inclusive traits and sales data to keep customers in the loop on their favorite products. TripAdvisor effectively reminds users of the value in their abandoned cart. If the customer ignores this push, too, they could include a discount in the next push. GrubHub keeps users informed on when their deliveries will arrive. They use clever wording to make the message exciting and enjoyable to read. iHeartRadio ties Women’s History Month into their push notification to make it feel more organic and justified. The more relevant an event is to the promotion or CTA (call to action), the more effective the topical push will be. Charlotte Russe uses capitalization to generate excitement in their promotional push. Their push provides a reason for the sale (“Appy Hour”) and conveys all the necessary information a user would need to partake. Once you’ve gotten users to download your app, push notifications are a great (free) way to increase conversions and revenue — but don’t abuse the privilege. Be thoughtful, be relevant, and be helpful, and your users will reward you by engaging. The post How to maximize value from push notifications appeared first on Marketing Land.